Antiques experts travel the UK searching for treasures. Mark Stacey and Catherine Southon start in Dundee and travel through Forfar and Inverurie on their way to Aberdeen. Browse content similar to Episode 23. Check below for episodes and series from the same categories and more! to scour Britain for antiques. -There will be worthy winners and valiant losers. Oh! Come on, I've got to get another shop. as they begin the third leg of their road trip. -You pulled it out of the bag, didn't you? -I do not know how that happened. But I'm over it. including our experts' impromptu dog challenge. making a whopping profit with his doggy offering in the last leg. I mean, how horribly revolting is that? At 48, are you all done? especially when unleashed on all things scientific and maritime. But she's not so good on dry land. Oh, crikey, I haven't done this for such a long time! it's still all to play for with just over £25 separating the pair. giving her a more than respectable £245.90 to spend today. has the lead overall with £271.34 to play with. Mark and Catherine are nipping about in their nifty 1968 MG Midget. -I'm going to be very, very tactical. -Yes. The gloves are off. -That worries me a bit. -The gloves are off, Catherine. before ending up in the beautiful capital city of Edinburgh. clocking up 115 miles along the way. spanning just over two miles across the silvery Tay. Catherine is dropping Mark off at his first shop. it's now filled with a wonderful array of collectables and oddities. -I think you're going to need a lot of luck here. -Are you trying to unnerve me? -Well, I'll tell you one thing, it won't work. It's just as well these two are old friends. Inside Clepington Antiques, owner Derek is standing by to help. -I'm Derek, how do you do? -Nice to meet you, Derek. Mark's decided to get all tactical on us. but it looks as if it's just come from a house clearance. But there's no price on that. Oh, that's a good tactic, Mark! Can I just say something to you at home? That's not recommended! -You shouldn't actually do that. Unless you want to pay the full ticket price for it. but best find something else to look at, eh? Oh-oh, what have we got here? A pooch purchase, perhaps? I just think these are so ridiculous, these things here. That's how I felt after the auction yesterday. So I had a lot to drink last night and then I woke up like that. I just think they are so absolutely bizarre. -They are liquor bottles, aren't they? But to buy them, I have a price in mind, which is very mean. -I will say £10 for the three. -Do you know what? It's so close. -You're going to give me 12? No, that would be far too generous for you, Mark. because they are just fun, aren't they? -Can we have them for a fiver? Call it £2 each, £6. That's cheap, isn't it? £6. What have I done? What have I done? Who can say, Mark? Let's hope they don't leave you in the doghouse! But he's not finished yet. an old industrial office phone. Gosh, this is quite heavy, actually. It's an unusual looking phone, isn't it? It's Bakelite. we're probably looking at no later than 1950s, possibly to the '30s. A little pull-out here for your extensions or for writing a note. Priced at £30, time to get Derek back to see if your number's up. -I would do that for £20 for you. for a piece of industrial history. Oh, I've got to have it for £20. Thank you. three dog-themed bottles and an industrial telephone. the Royal research ship, Discovery. the Discovery was built right here in Dundee. a ship tailor-made for the first adventure of its kind. The Discovery was launched in 1901 for Antarctic expeditions. and Ernest Shackleton to the south polar region. She is now the centrepiece of a visitor attraction in her hometown. by Jill from the Dundee Heritage Trust. Take me from the start, Jill. 1901, the expedition started? headed by Captain Robert Scott. He was obviously to become famous as Scott of the Antarctic later. This was heading south into really the vast unknown. when they headed to the Antarctic in 1901. Scott sighted the Antarctic in January 1802.
and was able to determine that Antarctica was indeed a continent. and was stuck fast for two years. I think it's a testament to how strong and well built this ship was. and when she was freed from the ice, she was virtually unscathed. geological and biological discoveries of the time. with its beautiful mahogany panelled doors. very rich with all this mahogany panels. It seems a bit upper-class. but you have to remember that this was a working space as well. so they would have been preparing animal skins, dissecting specimens. and things going on in here during the day. But come the evening, that was all cleared away. out would come the Royal Doulton china, the silver-plated cutlery. There would be grace, speeches and proper etiquette for dinner. Real classic Edwardian Royal Naval traditions, yes. by Royal Dalton for use on the officers' ward room. of a penguin, and the iceberg, Discovery Antarctic Expedition 1901. And it was all part of keeping up morale and doing things properly. And this is an object which I almost feel has the status of a holy relic. and these were actually Captain Robert Falcon Scott's. -They have his initials carved into the top - RFS. from the incredible glare of the sun on the vast expanse of ice. you could suffer from snow blindness. but none as dramatic as the Discovery expedition. succumbing to the unforgiving Antarctic climate. and adventurous spirit of the early Antarctic explorers. dropped off at the compact and bijou Forfar Antiques And Collectables. -Am I in the right place? No need to be personal! and David may just have a few bits of treasure in his wee shop. -And work your way through. -I'll see you in about half an hour. -That panel is rather fun, isn't it? I love the marquetry work on it. to form floral decorative patterns. That's not £50, is it? It would be lovely if I could buy it for £50! -David, I thought you and I were going to get on. It's one to think about, Mark, but it's a lot of money. It looks Austrian, maybe. I'm not sure. Has it got a...? -It's got "No 3 England", but just a number. -It kind of looks like it's advertising something. -What would you put in there, spills? -Tapers, yeah, something like that. Mark has a cunning plan. -You couldn't do the two for £100, could you? But what I will do for you is, I will do 130. Do you know what I'm going to say? To heck with it! I really like them and that's all that counts. Thank you, David. -£130 for the two of them. Well done, Mark, two more items in the old bag. That's £110 for the marquetry panel and £20 for the polar bear vase. Now, let's see if Catherine is as flash with her cash. in search of her shop du jour, Lovejoy Antiques. Gosh, this is a treasure trove, isn't it? Hello! Hello, I'm Catherine. Eagle-eyed Catherine quickly spots something pretty she likes. This actually has caught my eye. That's quite sweet. I think it's caught my eye because I would love to wear it myself. That's quite nice. It's stamped 925, so it's silver. And I think these are probably amethyst. What could you do that for? It's in the Art Nouveau style, but maybe doesn't have a lot of age. Now, here's a rather snooty-looking fellow for your doggy challenge, Catherine. SHE CHUCKLES It's actually an ashtray! but there is absolutely no competition here. It's a cut above Mark's, certainly in price, with £75 on the ticket. but Catherine seems to have fallen for its more quirky quality. That's two items to consider. Could this be a third? What does this pen say? Yeah, but it's important to check the nib, see if it's damaged in any way. fountain pens are again becoming very popular. which might explain its ticket price of £55. Based on that, it would be 40. Ah, Bab's not for turning. The dog, the necklace and the pen. Yeah, I think 120 is absolute tops. and at £60 for the ceramic poodle ashtray. She's certainly determined to win the pooch purchase prize. What a busy day's shopping that's been. Time to put your feet up and reflect on a job well done. Nighty-night. and do I detect some love in the air? -This is so nice! This is wonderful. It couldn't be more perfect. -No cares in the world. Sitting in an MG, K-I-S-S-I-N-G.
and an amethyst and silver necklace. She still has £125.90 to spend. for an even mightier £156. a rare Art Deco marquetry panel and a polar bear vase. So he still has £115.34 to spend accordingly. Mark is dropping Catherine off in the lovely village of Dinnet. to show her a nice provincial piece. -Oh, that's nice, isn't it? It's very simple but very attractive design. Might be 18th century. It has got a lovely feel about it. Nice colouring. And this is a nice design. But there's not really a lot you can say about this, is there? -You could ask the price. -How much do you want for it, Dave? ..50 quid and I'm sure it's worth a lot more than that. It's the sort of thing that can make a lot of money. -It could do in the right sale. OK, shall we think about that one? Can we put that to one side? Catherine is going for a root about in Dave's spare rooms. I'm really, really scared of spiders, you see. -You're scared one will come out and bite you? -Oh, David, look at those cobwebs. Keep calm, Catherine, and carry on. -These advertising tins are very desirable. Especially the big well known brands. And Lipton is right up there with the very well known brands. That's wonderful, isn't it? Showing all the tea pickers in Asia. Is it on every side as well? Oh, that's lovely. It's just very...how shall I say...? or Ceylon, as it was known at that time. But because you're a special person you get it for a bit less. -You and I are going to get on well, Dave! You'd probably get on a bit better if you made him an offer. What could you do the two at? 50 and 40? 80 quid for the two. -Don't look at me like that! I'm happy to give you 40 for that bowl, because I think that's fine. Um, I'd like to give you a little bit less than 35 for that, though. -That'll be 70 for the two. -Is that all right? Are you all right with that? You could do really well out of that. I think you could do really well out of that. And that's your shopping all done and dusted. at Tower Workshop, where George is holding the fort. which is particularly appropriate for Scotland. And it's basically an item of Treen. Treen is any item which is small and turned of wood. because on the front we've got "Castle Street, Aberdeen." This is, I think, sort of mid-19th century, 1860-ish. Can you do it for 40? Give me a bit of a fighting chance. -I'm not known for my discounts. -Oh, you are! You're great, George. -Do you want me to come back? -I want you to come back. Thank you, George. Done! I've bought Aberdeen for £40. Well, not the whole of Aberdeen, just Castle Street. and both our experts are done with all their shopping. to visit one of the area's most magnificent castles. home to the clan Fraser. who was part of William the Conqueror's invading force. -Hello, I'm Eleanor. Welcome to Castle Fraser. -I'm really looking forward to this. Shall we go in? -This is a grand room, Eleanor. We're here to see this painting of Andrew, the first Lord Fraser. -in the castle today, so it's his creation. -I'm rather worried, though, that there is a funny hole in the wall. Clever of you to spot that. Why don't we go and have a look at that? -Oh, yes, I can see straightaway. That's the hole. -Can I have look down there? -Yes, do. Let's see what we can see. -of the hole, don't you? -It's quite low down, though, isn't it? -It is strangely low down. They don't make themselves comfortable. henchmen would burst in and kill everyone. than my battling on the Antiques Road Trip! we can go and see something quite interesting next. I'd love to. Lead on. with their military spirit passing down through the generations. in the Duke of Wellington's army during the Napoleonic Wars. Charles has a wonderful story to tell. to attack the castle of Burgos. He was ascending the castle on a ladder, leading his men. -..right through it, where he was shot. -Dare I ask what happened to the second bullet? ..which he tragically had to have amputated a few weeks later. -Good heavens above. This is his leg. This is his actual wooden leg, yes, which he wore the rest of his life. -because he went on to have 14 children! Eleanor, thank you so much for showing me around. It's so nice to meet you. I hope you enjoyed it. the Road Trip has ever had. Such serenity belies its treacherous past. Now, keep it friendly, you two! -Please don't tell me off. I've got to look at it. Oh, it's fabulous. But you've copied me! Oh, Catherine, that is fabulous. Oh, I absolutely adore it. -Have you ever seen one like that? -I want him. I'm going home. It's mine. -Come back! He's so Brighton, isn't he? -You're not putting this in the auction. -He's so Brighton, isn't he? -I'm having it. I'm absolutely having that. That's going to win the pooch purchase. Well, I hope they have your sense of humour and your style in Aberdeen. -Now, what's this all about? -Oh, that's lovely, isn't it? -It's quite nice, isn't it? -How much is it worth, though? -That could be interesting, though, couldn't it? -made in the provinces of China. -But it could be interesting. If you keep saying it often enough, Catherine, it could be interesting. I think actually, it could be interesting. -It could actually be interesting. We'll find out soon enough how interesting it could be. So, moving on to Mark's bundle of goodies. -You won't like any of these. -This is a little story, this is my pooch purchase. -But I've got to explain. This is me after the auction, last shot. -This is me at the bar feeling really sorry for myself. -And that's me in the morning. And the Queen's statue, Aberdeen. What does that say? -I've never seen one of these before, have you? -No, if it makes you feel better. -I love it. I think it's great. It is JUST Bakelite. It's not 14 carat gold. I don't think they did them in the '30s and '50s. it's not ruby encrusted, it's JUST Bakelite. That's all it is, Bakelite! So, just to be clear, it's a Bakelite phone. -No, there is another one. -I knew you couldn't disappoint. -I think you'll hate it, Catherine. I paid far too much for it. But I just fell in love with it. And look at all the marquetry panelling around it. -But it was a lot of money. -I think you've pulled it off with the pooch purchase. -I just had fun with them, actually, this time. -Well, we should have fun. We're not here to sell anything, we are here to have fun. Yes, and you'll definitely make on those, I think. -Before you witter on any more. Yes, less wittering, more telling us what you really think. I can't believe that reveal. That dog. She's stolen my show. I feel that he may have overpaid for that. £110 seems to me a lot of money. It's time to get back on the road and head to today's auction. and ending in Aberdeen for the auction. the granite city of Aberdeen has a very distinctive cityscape. its auction houses have thrived in this boom town. It looks more like a pub than an auction. -Maybe we can get a drink! -We might need it after today. -No, we'll be all right. We're fine, we've got each other. which has been specialising in fine arts since 1867.
thinks of our experts' items. It's a mixture of good, not so good and quirky, I would say. a quality thing and hopefully we can get something close to that. and hopefully there'll be interest on the floor as well today. and splashed out £196 of that on his five lots. the same as Mark, parting with £195 on her five lots. Quiet, please! The auction is about to begin. -Whatever happens, we'll be smiling. -We will. Don't worry about that. -Oh, I won't. I've got you by my side. will RING true with the bidders. 20 I'm bid. 22. 24. 26. 28. 30. 32. 34. 36. 42. OK, 42 with the gentleman seated. Any more interest after 42? Anybody at all after 42? No-one? Looks like you got a bit of a fright there, Mark. But you called it right. A great start. the Art Deco marquetry panel. But has he overpaid and let his heart rule his head? -It looks nice at a distance. -It looks better from a distance. It is better from a distance. 40, then. No-one interested at 40 for this panel? Anybody at all above 40? 46. 48. 50. 52. 54. -No-one at all after 56? Oh, no. He's not taking that loss very well. Would you like me to put my arm around you? I couldn't think of anything worse at the moment, Catherine, actually. it's time for your first lot - the gold-nibbed fountain pen. £80 for this nice fountain pen. 20 I'm bid. Any interest after 20 for this pen? 32 at the back of the room for the pen. Any interest after 32? 32 it is. -Oh... I had high hopes for that. Will her amethyst and silver necklace get her back on track? No-one at 30 at all? 30 I'm bid. 40 at the back of the room. Any interest after 40 for this piece of jewellery? -I think that's what it's worth. You've wiped your face with it. And a little bit more. A neat £10 profit there, Catherine. Now, this should spark some local interest. It's Mark's Mauchline pedestal vase, decorated with views of Aberdeen. 20. No-one interested at 20? 10, then. 10 I'm bid. Any interest after 10 for the Mauchline Ware? -It's just not my day, is it? Oh, dear, Mark, another loss. -Is there anything I can say to ease the pain? A chance to redeem yourself now, Mark. Up next is your polar bear vase. 40 for the... 40 I'm bid. for the polar bear? Anybody at all after 40? but I'm still crashing and burning here, Catherine. this small profit may generate a comeback, Mark. Will Catherine's advertising box brew up some interest? £50 for the advertising box. No-one interested? 20 I'm bid. Any interest above 20? I have 20 in the centre of the floor. OK, 44...in the middle of the room. No-one else? 44 it is. Thank you very much, Aberdeen. Glad to see you're taking this well, Mark! Not. Another steady profit for the lady. There is no justice in this business. Up next is the first of the dog challenge lots. Can Catherine's pedigree poodle win this leg's challenge? -40 for this novelty poodle. 20 for the novelty poodle. 20 I'm bid. Any interest after 20 for the novelty poodle? Any interest at all after 20? I'm really annoyed because I would have paid £100. And with that loss, they are almost neck and neck again. So, how will Mark's novelty liqueur bottles fare? This is it, my last lot of the sale. Please redeem me a little bit. £80 for these liqueur items. £80? You're having a laugh. Don't people put their alcohol in decanters any more? Anybody at all after 10? No-one at all? Time to lick your wounds, Mark. but it's been a "ruff!" auction for you. Now, Catherine needs to avoid making a loss here. but what will bidders make of her Chinese bowl? We've had some interest in this. I can open the bidding on this item at £60. 150 with Steve. Any interest after 150? And with that excellent profit, Catherine takes today's crown. Well, Catherine, on that pleasant note, let's go. after auction costs, leaving him with £218.02 to take forward. a very respectable £44.52 after auction costs. she starts next time with a bumper £290.42. Well, Catherine, I can't believe it. I'm back to where I started. -And you're way, way ahead of me. -There's no justice in this world, is there? That's what you think of Aberdeen. Cheer up, Mark, another auction awaits, mate. ..whilst Catherine proves she's no pushover. For that amount of money, Catherine. 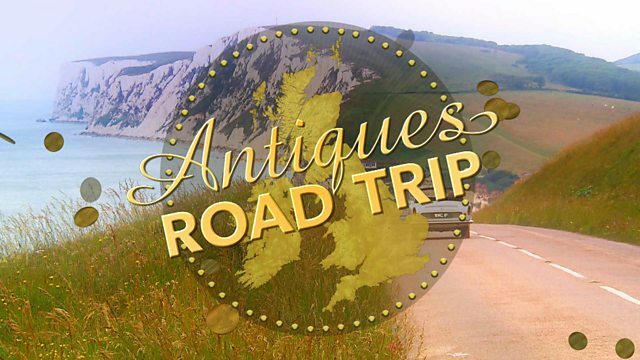 On this leg of their road trip Mark Stacey and Catherine Southon start in Dundee and travel through Forfar and Inverurie on their way to auction in Aberdeen.